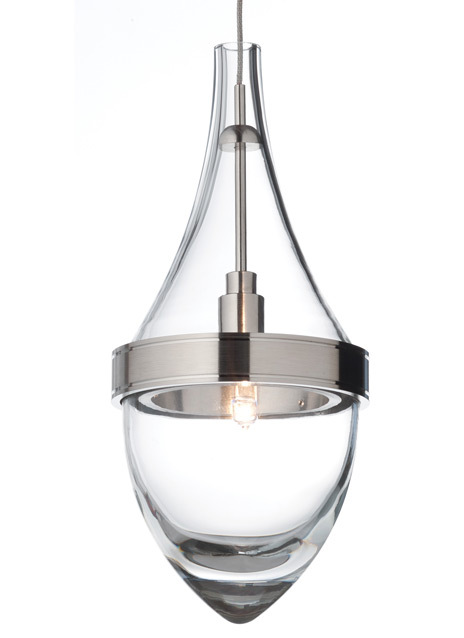 The Parfum light pendant by Tech Lighting is a modern take on the beloved French vintage perfume bottle. The silhouette is sleek and clean while still warm and elegant. A metal band separates the top and bottom of the hand-blown glass pieces. The bottom features a beautiful clear draw adding richness and depth to the design. This highly customizable pendant features either an Antique Bronze or Satin Nickel finishes and ships with your choice of halogen lamping, both lamping options are fully dimmable to create the desired ambiance in your special space. The Parfum is ideal for bedroom lighting, bathroom lighting and dining room lighting applications. A metal band s eparates the top and bottom hand-blown glass pieces, and the bot tom glass features a beautiful clear draw adding richness and depth to the design. Includes low-voltage, 35 watt halogen bi-pin lamp (opaque bottom glass) or 20 watt halogen bi-pin lamp (transparent bottom glass) and six feet of field-cuttable suspension cable.